It's Abraham Lincoln's 210th birthday today, but you wouldn't know it by watching the number of states that observe the day as a paid holiday. [Attachment] Currently, the Lincoln holiday is celebrated unofficially nationwide, as part of what many states call Presidents Day, which falls on Monday, February 18 this year. Just a few states celebrate the actual Lincoln birthday on its date. And technically, the federal Presidents Day commemorates George Washington's observed birthday: There is no national holiday called Presidents Day. The third Monday in February is the date designated for the federal Washington's Birthday holiday under the Uniform Monday Holiday Act of 1971. 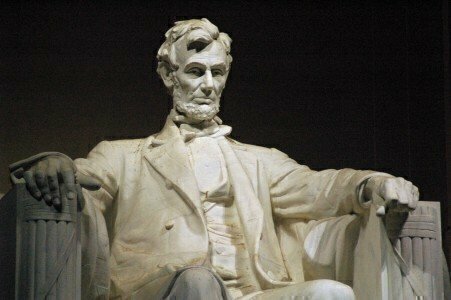 So on February 12, Lincoln's real birthday, there are few celebrations on a state level, along with a ceremony at the Lincoln Memorial in Washington, D.C. There is also a wreath ceremony at Lincoln's birthplace in Kentucky. There were efforts right after Lincoln's death to get this birthday recognized as a holiday, but there has never been a federal Lincoln-birthday holiday. By 1890, Lincoln's birthday was observed as a paid holiday in 10 states. According to one blog that tracks the holiday, in 1940 24 states and the District Of Columbia observed Lincoln's Birthday. Now, after the Uniform Monday Holiday Act was passed in 1971 and states moved toward considering the federal Washington-birthday holiday as Presidents Day, there are just a handful of states that honor Lincoln directly. The states that currently have Lincoln-birthday holidays on February 12 include Illinois (Lincoln's adopted home state), California, Connecticut, Missouri, and New York. There have been several attempts in Congress to get Lincoln his own national holiday, but none have succeeded. Now, more states celebrate Black Friday (the day after Thanksgiving) than Lincoln's birthday. In fact, 18 states, not including Indiana, have days off for state employees for Black Friday. Another 10 states give their employees the day off for Good Friday, and five states recognize December 26 as a holiday. And although it may seem odd that Indiana, and also New Mexico, honor Lincoln on the day after Thanksgiving, it was President Lincoln who issued the proclamation in 1863 that officially set the precedent for America's national day of Thanksgiving.